After several close finishes over the past few week, Team NordicSkiRacer's Jay Woodbeck pulled off the win at the hilly Forbush Corner 17k Freestyle this past Saturday, in 55:34. Milan Baic was just behind by 2 seconds (55:36), with Dan Yankus third in 55:43. For the women, Erica O'Hearn was at the top in 1:05:44, followed by Rebecca Davis and Mariah Frye in 1:09:09 and 1:09:29. In the 8km division, Matt Villata, Brad Plummer and Max Miller were the top three, in 35:39, 41:50, and 45:13. The top three women were Abby Potts (37:32), Laura Thibodeau (43:18), and Ellie Callison (50:26). 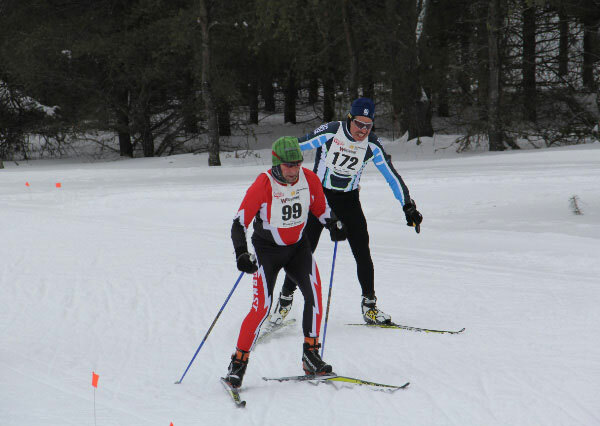 Says Ann Wagar, "The Meijer Forbush Freestyle race was a big success with lots of smiling skiers before and after the race, especially while enjoying the delicious post race food. The food was prepared by Mike Everts from Blackbird gardens catering. The soup and chili was very tasty and very healthy. It was wonderful to see all 98 participants enjoying the trails. Thank you for racing with us, the Forbush Clan." 60-69 ? Rick Kraai ? ?